Herbal Essences Frizz Fighter Smoothing Conditioner with Mandarin Oil & Pearl Extract. I am a fearless tamer for Frizzy Hair. I'm a nourishing formula with mandarin oil and pearl extract. Let me tame your hair making it smooth from strand to strand. I'll fight for your right to banish the frizz. For extra smooth-as-silkiness, start with my smoothing shampoo. This is no longer listed by the manufacturer but may be available elsewhere. Aqua, Stearyl Alcohol, Cetyl Alcohol, Stearamidopropyl Dimethylamine, Glutamic Acid, Bis-Aminopropryl Dimethicone, Parfum, Benzyl Alcohol, Citric Acid, EDTA, Hexyl Cinnamal, Sodium Chloride, Butylphenyl Methylpropional, Linalool, Propylene Glycol, Benzyl Salicylate, Geraniol, Limonene, Magnesium Nitrate, Margarita Powder, Citrus Nobilis Peel Oil, CI 47005, CI 14700, CI 17200, Triacetin, Methylchlorioisothiazolinone, Magnesium Chloride, Methylisothiazolinone, Sodium Benzoate, Potassium Sorbate. It's a good conditioner, it made my hair cilky smooth and easy to comb, but it doesn't eliminate the friz completely. But I couldn't expect it from such inexpensive conditioner. Anyways, this is agood one! 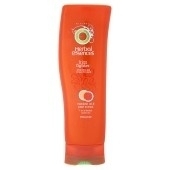 Aimed at frizzy hair this conditioner is rich and smells lovely, fresh and sweet and of mandarins. It is easy to use and rinses out well leaving my hair smelling nice. fresh and sweet as well as soft and silky. "It's a good conditioner, it made my hair cilky smooth and easy to comb, but it doesn't eliminate the friz completely. But I couldn't expect..."